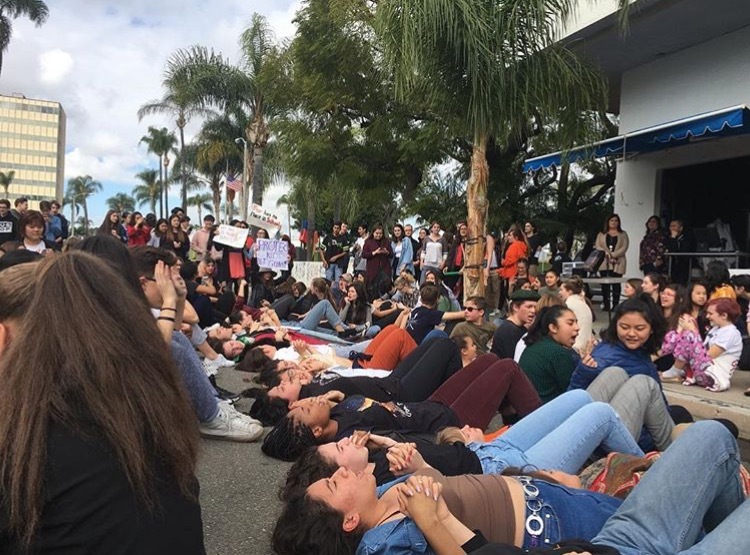 After an evacuation drill, students from Orange County School of the Arts prepared themselves for the nation-wide school walkout. While some students returned to class, most peacefully made their way toward 10th street, which was already crowded with those willing to protest. Chants rang out, signs were held up, hands were written on and faces were painted; the street was dotted with shades of orange, which students wore to commemorate the 17 who had died in the Parkland shooting just a month before. As the 17 respectful minutes went by, students turned their heads to those giving speeches. The moving words of the students brought many to tears and evoked others to hug those next to them, regardless if they knew them. We were then told to hold hands, which created the most powerful connection between students I have ever felt before. In those minutes, we gave a voice to those who can no longer speak for themselves. Students were able to use their anger peacefully during this protest. The call to arms was made very clear because of the passion they brought with them. Many of these walkouts, but not all, were school approved. Students were granted 17 minutes without getting unauthorized tardiness or truancies. Some students, like Zweig, felt that this took away some of the power that the walkout was supposed to ignite. While it felt good to know that admin was behind us, the rigid organization made some feel it gave the notion that it was an “assembly” rather than a protest. While exercising our first amendment right, students used this walkout to show those of higher power that they have a voice, and we’re not afraid to use it. Whether it’s to try to end school shootings, push for stronger gun laws or just to pay respects to those who have died, the walkout shows that we ’re aware of these issues, and we’re going to put an end to them. Change may occur slowly over time, but this one walkout has sparked the attention of many. With more on its way, our message continues to be pushed, and eventually, it will be impossible to ignore.